Who doesn't love a splash of color, especially during this time of year? I know I'm a sucker for color, skulls, Fall, and anything Day of the Dead inspired. You know what else I am? I am a hoarder of all the cool things because I swear, at some time, **THE** perfect project will come along and I'll have just the perfect idea for it! Such was the case for this wood skull, sent to me by my iBFF, Jess Mutty. She sent about a year or two ago and I've held onto it, just waiting for the "AHA!" moment to strike. And boy did it! Using one of the thicker canvases I had stashed away, I came up with this piece of decoration that just sings to me. Take a flat, one dimensional wood cut and give it life by enhancing the features with rolled out Easy Sculpt clay and my signature bead work. And just look at that vivid, lush color! That, my friends, is courtesy of the amazing ColoriQue inks by Lisa Jimenez. These inks are high impact, bold, bright, and absolutely blendable too! 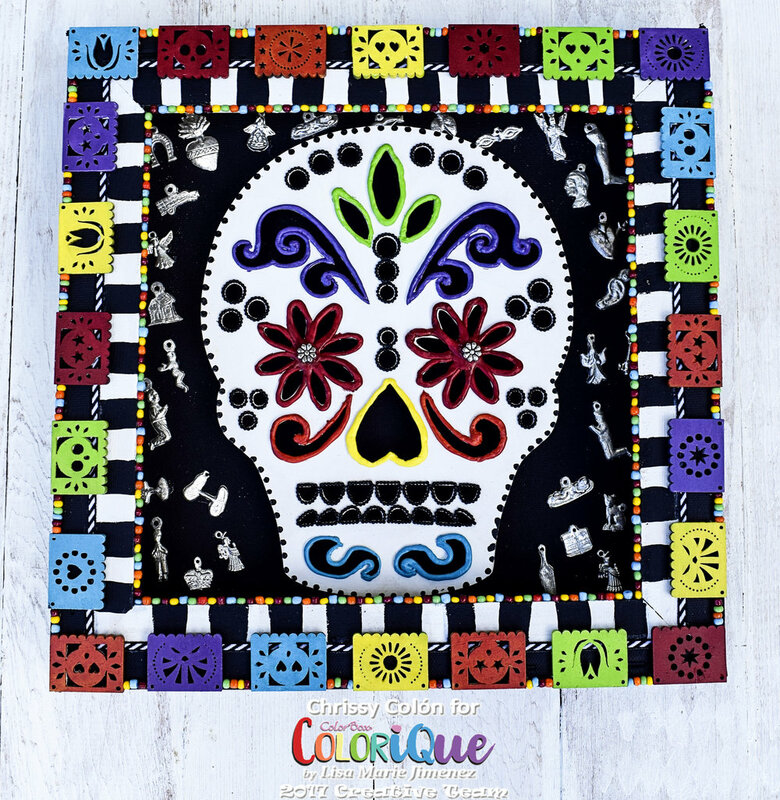 I've used them on the clay detailing of the skull, but I've also used them on the Papel Picado from Retro Cafe Art Gallery. Just look at that blindingly beautiful pigmentation! Add in some colorful glass seed beads to finish off the framing and I can call this bad boy DONE, SON!